Cover by Jack Kirby and Joe Sinnott. "Day of the Demolisher!" Part 2 of 2. Guest-starring Deathlok, Nick Fury, and the Fantastic Four. Impossible Man cameo. Story by Marv Wolfman. Art by Ron Wilson and Pablo Marcos. 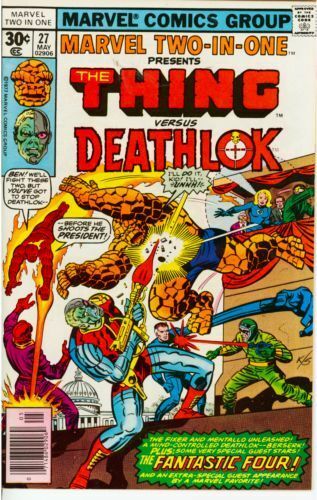 As Ben's teammates in the Fantastic Four and Nick Fury take on Mentello and the Fixer, the Thing faces off against the cybernetic killer, Deathlok. Cover price $0.30. Nicholas Joseph 'Nick' Fury Sr.